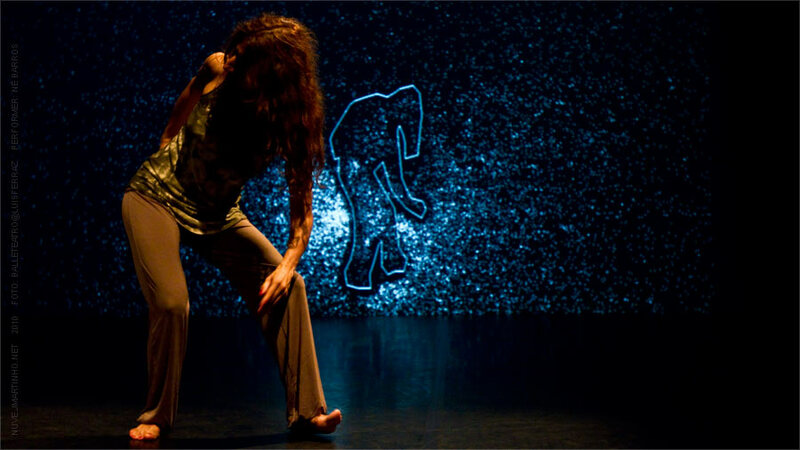 NUVE is an artistic project that aims to explore the artistic possibilities offered by the digital dance performances in the interaction between the individual and his virtual double. In NUVE we conceptualized, developed and implemented a digital artifact, resulting in a fluid digital performance based on the theme of the analog body versus the digital virtual body. The digital artifact is intended to create a virtual character, a virtual persona, or a virtual performer, which will interact with the real performer, aiming to explore new fields in the area of digital art. The motivation for this project is to create a scenic spectacle driven by an interactive and generative digital artifact, designed to reveal the emergence of virtual characters, auto discovered and experienced in moments of artistic creation, exploring artificial extensions of what makes us human. Contemporary art sets the scenery for a body exploration based on movements, actions and behaviors. Among the different crossings, the digital art is still under expansion on the dance domain. 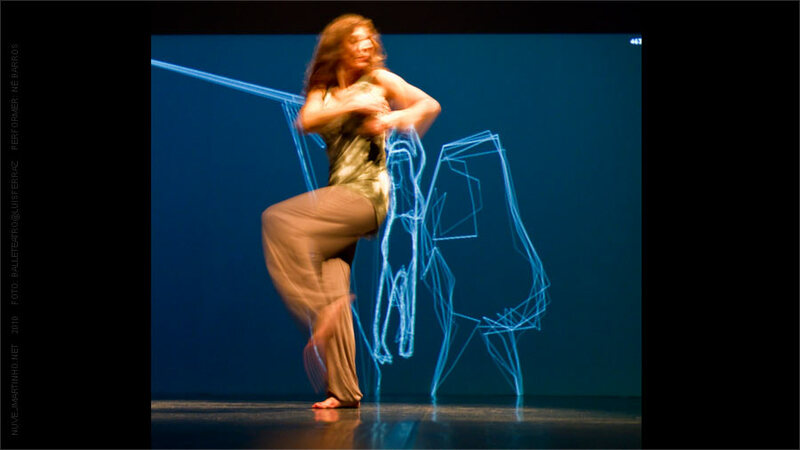 Despite the art of dance has appropriated a variety of new technologies, it is still a domain to explore with the potential at an aesthetic and at an artistic level. 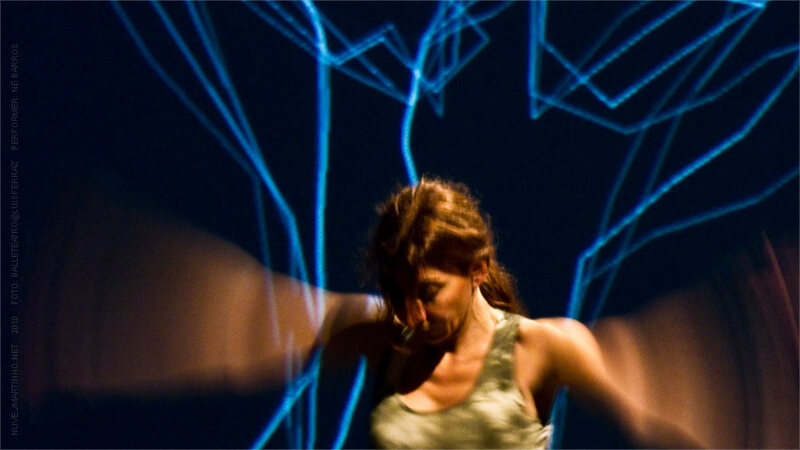 NUVE emerges from a line of work being developed by the first author  that explores full body interaction and expressive gestures to compose immersive audio and visual flows supporting artistic expressiveness. In the author’s previous work physical expressive gestures are rendered in digital compositions formed by musical and visual movements, composing an enriched audio-visual experience . In NUVE the body is the first engine of action, but the choreographic body evolves into a relation with its own “virtual double” in a way to create a dialog challenging the choreographic boundaries and adding new dimensions to the gesture. 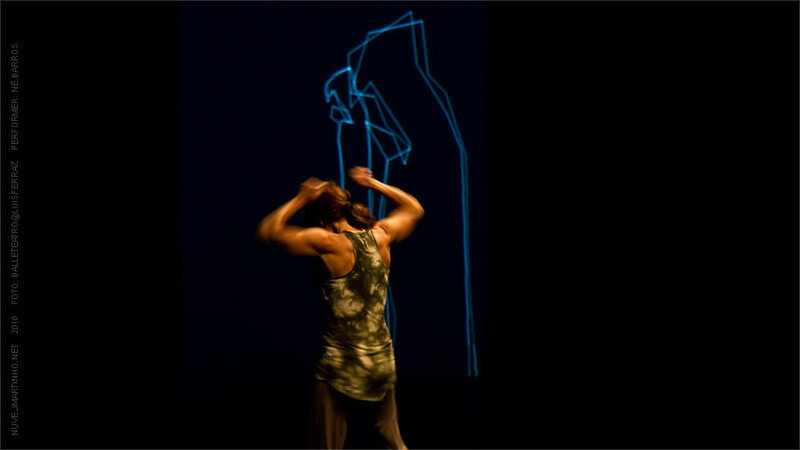 Throughout the choreography a tension is built between the performer’s silhouette and the “virtual double”. At some stage in the narrative, the “virtual body” detaches itself from the performer and the choreography evolves, the “virtual double” is no longer shadowing the performer but in a way seems to gain life from him/her and both perform together. NUVE follows the line of generative digital art, composing in real-time ever evolving visual scenarios that flow with the performer movement and gesture contrasting light and darkness, body and gestures, real and digital. The audio and visual sequences of the narrative are pre-established to follow the created choreography. NUVE is prototyped in the processing platform , an open source JAVA programming language, and developed with the openFrameworks platform , an open source C++ programming language toolkit. Communication between processing and openframeworks is made via OSC (open sound control). It relies on a hand modified infrared firewire camera to capture the image of the stage 30 frames per second. Appropriately infrared lights are employed to obtain the best possible image of the dancer. A combination of standard image processing techniques is then used to capture the silhouette and the movement of the performer. 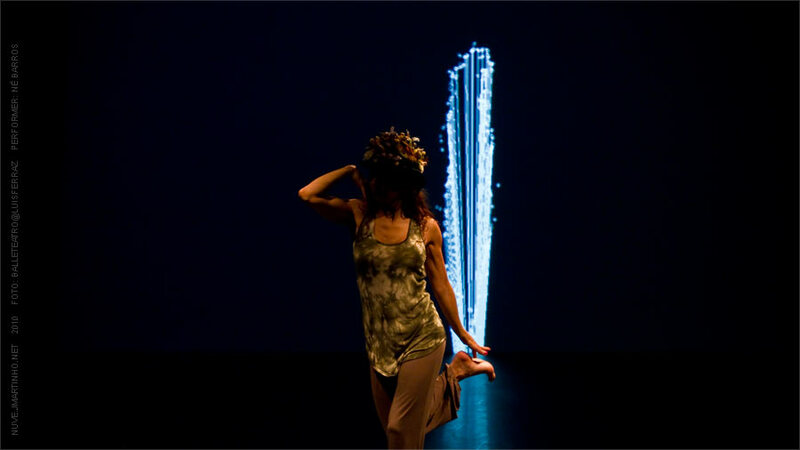 At some points during the choreography the performer interacts with a particle based system that flows in the scene. This seamless interaction between the full body of the dancer and the virtual particles is possible by computing the different speed of the different areas of the body and feeding it those to the particles physics system. The sound composition was created with the software SuperCollider, a system to program generative sound . In opposition to previous work  in this project the audio is not generated in real-time, instead the sound aesthetics was carefully crafted specifically for NUVE. 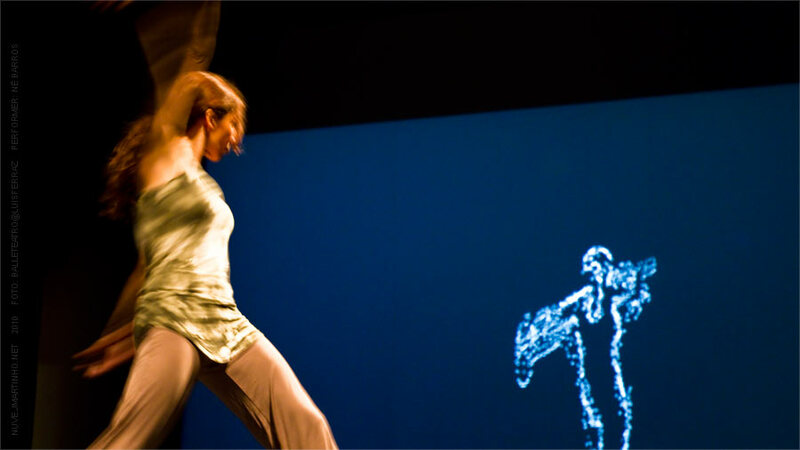 João Martinho Moura, Né Barros, Adérito Fernandes Marcos, Pedro Branco (2011).“NUVE – Dancing with a Digital Virtual Body”. IJCICG – International Journal of Creative Interfaces and Computer Graphics.